First of all, Stephen McGibbon introduced me to FolderShare earlier this month and it has quickly become part of every PC we own… sharing information between home and work, between PCs at home, and photos between our family members in Singapore, Cyprus, England and America. www.foldershare.com has also been updated to makes managing FolderShare libraries and computers easier. It’s completely free, and available for Mac OSX too! Apple's iPhone, which went on sale nine months ago, isn't the only smartphone that provides itinerant access to the Web. But its wide screen and top-quality browser make it easy to use and read, which means it can in seconds change a lighthearted conversation into the pursuit of truth. "It's turned me from a really annoying know-it-all into an incredibly annoying know-it-all, with the Internet to back me up," said Sadum, a technology writer in Denver. "It's not a social advantage." However, Helen Wang, a senior researcher in the systems and networking group at Microsoft Research, explains that the same-origin policy fails by forcing "Web applications today to either sacrifice security or functionality." She says that a lot of great functionality, such as that of mashups, comes from using tools from multiple sources. The problem is that when the website creator embeds code written by a third party on her site, the same-origin policy no longer offers any protection, and the embedded code likely has access to information stored on the creator's site. For example, if the creator of a forum embeds a mapping application on her site, the code in the mapping application could potentially access log-in data for the forum. Mashup makers, Wang says, either give up security by accepting those risks and trusting third-party tools, or they give up functionality by denying themselves the use of untrusted tools. Now a new wave of Silicon Valley companies is bringing live socializing back into a medium that has, in the parlance of the technologists, grown overly asynchronous. Vivaty, a start-up based in Menlo Park, Calif., is creating 3-D virtual chat rooms that people can add to the Web pages and social networking profiles on the sites where they spend most of their Internet time. Microsoft, seeking to expand offerings on its Xbox 360 console, has reached an agreement with a company headed by Peter Safran, the veteran Hollywood producer and talent manager, to produce original shows for distribution on the system. Through regular, copious posts, Troll Tracker quickly drew a devoted following in patent law circles, even among those who disagreed with its point of view. What readers didn't know, however, was that the blogger was Rick Frenkel, in-house patent counsel at Cisco Systems (CSCO), the Internet infrastructure giant. Cisco didn't sanction the blog, but it, like other tech firms, has waged a long, public battle against so-called patent trolls. And in its pointed commentary, Troll Tracker advanced views squarely in line with the company's own agenda. Cisco General Counsel Mark Chandler even cited the blog as a good independent source of information while in Washington lobbying for changes to patent law that would rein in trolls, unaware he was plugging the work of a Cisco employee. Last year, Wall Street fell back in love with Jeff Bezos, CEO of Amazon.com. Sales at the Seattle e-commerce pioneer grew 38.5%, to $14.8 billion. Earnings grew 150%, to $476 million. Outside of Apple, Amazon (AMZN) may now be the strongest one-stop shop for digital media such as MP3 songs and online movies. It's certainly the leader in digital books, with the release of its Kindle e-reader and its acquisition of Audible.com. Perhaps Amazon's most promising development in 2007, though, was its Web-services platform, which allows other companies to buy the technology Amazon uses to run their own operations. Hundreds have signed on—mostly small tech startups. TIRED of hearing other people’s cellphone conversations? It may become worse. Soon you may have to watch their favorite television shows and YouTube videos, too, as they project them onto nearby walls or commuter-train seatbacks. Pint-size digital projectors are in the works. These devices, when plugged into cellphones and portable media players, will let consumers beam video content from their hand-held devices to the closest smooth surface — entertaining themselves, annoying their neighbors and possibly contributing to a new warning sign: No Projectors in This Area. Unauthorized software that was secretly installed on servers in Hannaford Bros. Co.'s supermarkets across the Northeast and in Florida enabled the massive data breach that compromised up to 4.2 million credit and debit cards, the company said Friday. The breach has prompted concern in the industry because it appeared to be the first large-scale theft of credit and debit card numbers while the information was in transit. I'm a Wikipedia administrator and greatly enjoyed Nicholson Baker's recent piece, "The Charms of Wikipedia" [NYR, March 20]. In it he says, "Someone recently proposed a Wikimorgue—a bin of broken dreams where all rejects could still be read, as long as they weren't libelous or otherwise illegal." Your readers may well be pleased to hear that to some degree it already exists—take a look at the Wikipedia Knowledge Dump at WikiDumper.org. Check it out: "WikiDumper: The Official Appreciation Page for the Best of the Wikipedia Rejects. 'One man’s trash is another man’s treasure.'" Steve Gillmor recently blogged about Twitter as earthshaker, calling it a communications platform that will blow right past everything except platforms that allow it to dominate. I wish he would’ve limited his post to 140 words (we won’t force a blogger to use only 140 characters). That said, there’s something to his idea that Twitter represents a powerful twist on communications. It’s sort of like a digital, everyday Christmas card (such cards, after all, invented the one-to-many communique). That’s absolutely powerful. “Live” refers to consumer and very-low-end small-business offerings. Examples: Windows Live Messenger, Office Live Workspace. “Online” refers to small-/mid-size and enterprise services that are hosted by Microsoft in its own datacenter. Examples: Exchange Online, SharePoint Online and now Dynamics CRM Online. “Hosted services” refer to Microsoft offerings that are hosted by its integration/reseller partners at the partners’ facilities. Examples: Exchange Hosted Services, SharePoint Hosting Services. Hryb, who blogs under the pseudonym Major Nelson, said Microsoft would reset cheaters' "gamerscore" accounts to zero and eliminate all past achievements. Their gamer profiles would also publicly show they've been caught cheating, according to Hryb. "Xbox Live remains committed to keeping the service free of cheating in order to maintain a fair and level playing field for everyone," said Hryb. Timing is everything... The Navio/NCI stuff was not ready for prime time, a dozen years ago. Where is he heading with all this? Microsoft's not saying much but my colleague Dan Farber wrote after Ozzie's speech that Microsoft's likely "working on the plumbing required to create a seamless mesh that can synchronize content, services and applications across a variety of devices and user scenarios via the Web as a hub." Sounds plausible but what an irony that a decade ago, Larry Ellison and Scott McNealy were talking about a not all too different scenario. At the time, those two were barnstorming around the country to promote the then-foreign concept of the network computer. Of course, their aim was to sink Microsoft by obviating the need for a rich proprietary operating system. But at a basic level, the network computer idea revolved around what today we would call cloud computing. Unfortunately for Sun Microsystems and Oracle, it would take another decade before the industry would create fast enough connections and enough storage to make it feasible. Hmm -- see the article for details. Doesn't look like good news for Adobe AIR, if Firefox 4 goes as planned. Beard's philosophy is this: The browser needs to evolve. Beard believes the browser concept hasn't fundamentally changed in 10 years. It's still an isolated piece of software, he says. Mozilla Lab's push is to blur the edges of the browser, to make it both more tightly integrated with the computer it's running on, and also more hooked into Web services. So extended, the browser becomes an even more powerful and pervasive platform for all kinds of applications. At the moment, these are two separate projects Mozilla is running to push out the edges of the browser: Prism and Weave. The law could give China influence in Microsoft’s courtship of Yahoo because in August 2005, Yahoo, a premier search portal, invested $1 billion in Alibaba.com, China’s largest e-commerce business. The investment gave Yahoo about a 40 percent stake in the Chinese company. Alibaba officials have said they believe that a Microsoft takeover of Yahoo would set in motion a buyback provision, making it possible for them to gain independence from Microsoft. This is a weird story: someone posts a hoax Craigslist ad saying that the owner of a home had to leave suddenly, and this his belongings were free for the taking. People believed the ad and starting coming by and taking his stuff. The U.S. Patriot Act, passed in the weeks after the September, 2001, terrorist attacks in the United States, gives authorities the means to secretly view personal data held by U.S. organizations. It is at odds with Canada's privacy laws, which require organizations to protect private information and inform individuals when their data has been shared. Nokia is increasingly confident of securing deals with the world’s leading record companies ahead of launching its flagship music service for mobile phones later this year. In December, Nokia announced plans for its Comes With Music service, under which people will be able to buy mobiles giving them access to Universal Music’s entire back catalogue for up to one year. Nokia is in talks with the other three leading record companies – Sony BMG, EMI and Warner Music – plus about 10 independent music labels about giving people access to their catalogues. After signing up for the free site at www.photoshop.com/express, members can upload their images and then edit them with Adobe’s simplified set of point-and-click controls for red-eye removal, cropping, exposure, saturation and other functions. Users can group images into Web albums and post them to popular social networking sites, all from within Photoshop Express. Each basic account at the site, which is still in a beta test version, gets two gigabytes of online storage, although Adobe soon plans to offer more services for a fee. Another Google Inc. executive is leaving the Internet search giant for social networking start-up Facebook Inc.
Facebook on Tuesday confirmed that Ethan Beard, the former director of social media at Google, will join the privately held company as director of business development. Mr. Beard is the second high-profile executive this month to leave Google, a company that was widely considered one of the best places to work in Silicon Valley. Oracle Corp. reported a 30% profit jump and 21% revenue increase for its fiscal third quarter -- but the results still stoked investor concerns that its many acquisitions haven't insulated it from economic woes, driving its shares down in after-hours trading. The company also gave financial guidance in line with Wall Street expectations. It forecast numbers that show it expects earnings per share in the current quarter ending May 31 to grow 19% to 23% from the year-earlier period. The company projects revenue growth of 15% to 19%. The nonprofit group behind Wikipedia, the mammoth Internet encyclopedia built by volunteers, is getting its largest donation ever -- $3 million from the Alfred P. Sloan Foundation. The award, to come in $1 million installments over each of the next three years, will help the Wikimedia Foundation become more financially secure as it hires more staff and seeks to improve the quality and reach of Wikipedia content, foundation leaders said. I have been reading the OOXML storm in a teacup for more than a year now. Am looking forward to the approval of OOXML as an ISO standard and to be able to move the discussion back to the things that actually matter: free and open source software. For a year, countless bytes have been wasted on what is now a very difficult plot to follow, specially for people that have not followed it since the start (or as Bill Maher said last week "Its like trying to make sense of a LOST episode". Note: am a Lost fan). This product strategy shift means that Google Apps now has two marketing stories: (1) it's cheap on the backend and frontend or (2) it's cheap on the backend. Google started with #1 (instead of paying Microsoft Office and Exchange license fees, pay $50 per user per year) but is now recognizing that may be too big a cultural leap for large organizations. So now it's offering option #2: (instead of paying Exchange license fees, pay $50 per user per year). With #2, the Google mantra of "Use Google Apps because it has a great consumer-tested UI" goes away, but the "less in your face" strategy may be more to enterprises' liking. Normally my digital peregrinations take me to destinations such as Facebook, YouTube and Boingboing.net. But lately I've been spending time visiting the Crab Nebula, Cassiopeia A and the Sombrero Galaxy. These addictive celestial visits come courtesy of two remarkable interactive astronomy programs from two companies that would love to vaporize each other -- Google and Microsoft. When the Cold War superpowers the United States and the former Soviet Union, contemplated moving their conflict to outer space, there was justifiable fear and dread. But a similar escalation by software superpowers may turn out to be a boon for all. Er...I mean the OpenSocial Foundation. This marks Yahoo's formal joining up. Expect Facebook to join too. Wire coverage. Cemaphore Systems, a company that specializes in e-mail backup services, is expected to announce on Wednesday a new product that allows people to automatically synchronize their e-mail, calendar and address books between Microsoft’s Outlook and Google’s Gmail. The service, called MailShadow for Google Apps, is being pitched as a “email continuity and disaster recovery solution.” In other words, it is intended to provide users of Outlook and Exchange, Microsoft’s mail server, with a secure backup. As such, it represents an interesting use of the Google computing “cloud” to provide a service for Microsoft users. But the technology also would allow businesses to rip out their Exchange servers and run Outlook, which millions of users are familiar with, directly from the Google servers. This cozy, stylish and handsome CNET fleece could be yours: be the first to send along a link to a video of Gore's you-may-not-record-this speech at RSA next month. The two biggest U.S. cable providers, Comcast Corp. and Time Warner Cable Inc., are discussing a plan to provide funding for a new wireless company that would be operated by Sprint Nextel Corp. and Clearwire Corp., people familiar with the talks say. The partnership would create a nationwide wireless network using WiMax technology, which is designed to provide high-speed Web access from laptops, cellphones and other mobile devices, as well as high-quality mobile video. Sprint and Clearwire have been working for months to cooperate on a WiMax rollout and are now trying to raise at least $3 billion for a joint venture. Online movie rental company Netflix Inc has surveyed its subscribers to gauge their interest in streaming movies to their televisions using Microsoft Corp's Xbox 360, a Netflix spokesman said on Monday. Today at the Open Source Business Conference, EnterpriseDB announced the introduction of Postgres Plus and Postgres Plus Advanced Server. Postgres Plus is an open source distribution of the PostgreSQL database and includes significant performance benefits and important ease-of-use capabilities for developers and DBAs. Bundled into a one-click, cross-platform installer, Postgres Plus is targeted at developers of next-generation applications and sets a new standard for commercial distributions of open source databases. Postgres Plus Advanced Server is a commercially licensed product that adds advanced capabilities to Postgres Plus, including robust Oracle compatibility, dynamic performance tuning, and sophisticated management and monitoring. The company also announced the availability of free tools, tutorials, and Web-based services for developers. More information and free downloads of Postgres Plus are available at www.enterprisedb.com. IBM, a fan of many open-source projects, has taken a minority stake in EnterpriseDB, an open-source database that competes with Oracle and MySQL. On Tuesday, EnterpriseDB is scheduled to announce a $10 million round of funding, with IBM taking a minority stake in the company. Existing investors Charles River Ventures, Fidelity Ventures, and Valhalla Partners led the round. As the editor of OpenDocument, I want to promote OpenDocument, extol its features, urge the widest use of it as possible, none of which is accomplished by the anti-OpenXML position in ISO. OpenDocument currently lacks formula definitions for spreadsheets. (To appear in OpenDocument 1.2.) Many core financial functions in spreadsheets are undefined except for actual Excel output. That output varies by version and service pack of MS Office. What happens if OpenDocument and OpenXML reach different definitions of those functions? OpenDocument does not presently support legacy features of Microsoft formats. That will be easier with a formal definition of those features. Without OpenXML, OpenDocument has no authoritative definition of those legacy features. That delays OpenDocument supporting them in some future release. OpenDocument does not have a robust mapping to the current Microsoft format. That requires an OpenXML that has completed the standards process. If OpenXML is unclear, it must be fixed in order to create a robust mapping between the two. The bottom line is that OpenDocument, among others, will lose if OpenXML loses. The blackout was the second longest in company history. In July, Netflix suffered an outage that lasted longer than 18 hours. On that day, the company's shares fell 7 percent as the market punished Netflix for a drop in customers. This time, the glitch came as Netflix's customer numbers are on the rise and its stock is soaring. Stock analysts upgraded Netflix on Monday, and the company closed trading at $38.18, up 5 percent. Over the past six months, the company's shares have doubled in value. To prevent rain over the roofless 91,000-seat Olympic stadium that Beijing natives have nicknamed the Bird's Nest, the city's branch of the national Weather Modification Office--itself a department of the larger China Meteorological Administration--has prepared a three-stage program for the 2008 Olympics this August. An intriguing proposal -- read the full article for more details, e.g., on how it would have to be "spectrum-sensing" technology when the U.S. government needs the spectrum ("for military and public safety agencies"). Almost eight years ago, Yahoo decided to lend a little startup a helping hand, featuring its search technology on the Yahoo home page and giving it money at a critical juncture. In cutthroat Silicon Valley, no good deed goes unpunished. The startup was Google, and Yahoo's generosity helped launch the most formidable competitor it had ever encountered. Jobs' fabled attitude toward parking reflects his approach to business: For him, the regular rules do not apply. Everybody is familiar with Google's famous catchphrase, "Don't be evil." It has become a shorthand mission statement for Silicon Valley, encompassing a variety of ideals that — proponents say — are good for business and good for the world: Embrace open platforms. Trust decisions to the wisdom of crowds. Treat your employees like gods. It's ironic, then, that one of the Valley's most successful companies ignored all of these tenets. Google and Apple may have a friendly relationship — Google CEO Eric Schmidt sits on Apple's board, after all — but by Google's definition, Apple is irredeemably evil, behaving more like an old-fashioned industrial titan than a different-thinking business of the future. Apple operates with a level of secrecy that makes Thomas Pynchon look like Paris Hilton. It locks consumers into a proprietary ecosystem. And as for treating employees like gods? Yeah, Apple doesn't do that either. Some some comic relief, read this recent NYT piece about Apple fans being thin-skinned, and then return to the Wired article and skim the comments. Social networking appears to be similar in this regard. 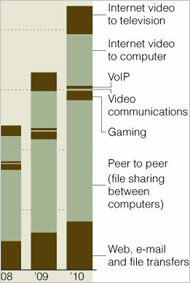 The big internet and media companies have bid up the implicit valuations of MySpace, Facebook and others. But that does not mean there is a working revenue model. Sergey Brin, Google's co-founder, recently admitted that Google's “social networking inventory as a whole” was proving problematic and that the “monetisation work we were doing there didn't pan out as well as we had hoped.” Google has a contractual agreement with News Corp to place advertisements on its network, MySpace, and also owns its own network, Orkut. Clearly, Google is not making money from either. A timely mashup reality check from John Montgomery. Popfly, a mashup tool, depends on three things: data that is simple to access programmatically, interesting, and available under terms that enable users to work with it. As with most software endeavors, you can pick two. The government has a huge amount of interesting data that's available under really great terms. Weather? Check out http://www.noaa.gov. Financial information? Start with http://www.sec.gov. Crime statistics? Dig around in http://www.usdoj.gov/. But how much of this is programmatically accessible? Very little, as it turns out. Read the full post for examples and currently state-of-the-art work-arounds. Scroll the list of the 10 most popular Web sites in the U.S., and you'll encounter the Internet's richest corporate players -- names like Yahoo, Amazon.com, News Corp., Microsoft and Google. Except for No. 7: Wikipedia. And there lies a delicate situation. With 2 million articles in English alone, the Internet encyclopedia "anyone can edit" stormed the Web's top ranks through the work of unpaid volunteers and the assistance of donors. But that gives Wikipedia far less financial clout than its Web peers, and doing almost anything to improve that situation invites scrutiny from the same community that proudly generates the content. Amazon.com apologized to buyers for having to wait up to six weeks to receive the Kindle electronic reading device after the company ran out. The world's largest Internet retailer sold out of Kindles in 5 1/2 hours after they went on sale in November and has been trying to increase manufacturing capacity, Chief Executive Jeff Bezos wrote Thursday in a letter on the Seattle company's Web site. Mr. Obama’s campaign said that the breaches were reprehensible. “This kind of game is a product of how people live and interact today, with the offline aspect as part of the draw,” said Jonathan Rochelle, a New York product manager at Google who discovered the game as an adviser to the Yale Entrepreneurial Institute. He views it as similar to software like Google Calendar and Google Docs — tools that enhance real-world collaboration. “Rather than isolating us in an online world, it enhances our interactions in the real world,” Mr. Rochelle said. Knowledge@Wharton: Speaking of revenue, what's Microsoft's revenue model for Silverlight? The first is: We sell developer tools and servers. Silverlight does not require those and they're fairly reasonably priced, but we will see some monetization through those businesses as people who are building Silverlight [applications] decide to buy Visual Studio or higher versions of Visual Studio than the free versions. The second way we will monetize is by having a connection with customers who are building these types of experiences. At the platform and tools layer, it offers us an opportunity to engage with them on advertising. That doesn't mean they have to use our advertising system. At the [MIX08] keynote [presentation], we specifically had DoubleClick -- soon to be Google -- on stage showing off their SDK [software development kit] for how you can integrate Silverlight with DoubleClick's ad system. By having a conversation with customers and giving them great tools and power with Silverlight, we expect that some proportion will say, "Hey, we'll also enroll in the Microsoft ad system." And that kind of advertising monetization is a two-way street: The sites doing the advertising get the bulk of the money, but we get a percentage by helping with the ad network. And then the third way that Microsoft is going to monetize Silverlight is through our own apps and our own sites, in terms of what we sometimes call "first-party applications" that we build on top of it. Obviously, we have a lot of apps that we build, not just in the developer's space, but in the knowledge productivity space and the enterprise space. I think that a lot of them will benefit from Silverlight as well. So we are going to be using the technology to build better apps for our existing product lines. "Pitting amateur and professional content against each other makes a good storyline, but it's misleading to see them as fundamentally opposed," says Werbach. "User-generated content will never match The New York Times for the overall quality of coverage of the Iraq war, for example, but reading Iraqi blogs, or political blogs about the war, provides some perspectives you won't get from any newspaper." And, he adds, "There's no way a traditional encyclopedia will ever match the coverage of Wikipedia, because there are so many more contributors. On the other hand, while the quality of most Wikipedia entries is surprisingly good, there are times you want the certainty of a reference work that is professionally edited and vetted, or a smaller set of resources that have been pre-selected by experts." Whitehouse agrees, and sees a hybrid approach emerging that embraces both professional and amateur content. Professional content on the web often has a user-generated component to it, whether it's a complementary blog or a user discussion forum. "The big challenge is the economic problem. What funded the traditional content model is falling apart," says Whitehouse. "Ideally, I see Internet content being a blend of professional and amateur content, but how do we develop an economic model that supports both?" Facebook plans to launch a new service that will enable the social network website’s 60m users to chat with each other online. The service, which is expected to roll out sometime in the next few weeks, represents Facebook’s latest challege to AOL, Microsoft and other makers of popular instant messaging programmes. One impetus of the change has been a campaign by Doug Morris, the chief executive of Universal Music Group, to find a way to sell music subscriptions. A key concept is that instead of charging people a monthly fee, the price of music could be bundled into a device. This well may be more psychologically palatable: You aren’t renting music; you own your iPod or iPhone, which has the rights to music attached to it. What I want: a "rental" option with seamless support for all of my devices. An excerpt from Sam Ramji's blog (he leads open source strategy for Microsoft) follows below -- the headline: Microsoft and the Eclipse Foundation are working together on two key open source initiatives, the SWT for WPF and Higgins interoperability. I’m writing this from EclipseCon in Santa Clara, California, where I’m going to announce the beginning of Microsoft’s collaborative work with the Eclipse Foundation. This started about a year ago when I met Mike Milinkovich at an open source event (the Open Source Software Think Tank 2007) where we were seated at the same table, and assigned to discuss “key issues inhibiting the growth of open source”. We found we had pretty similar ways of looking at problems – I found Mike to be very pragmatic and straightforward in his thinking. That discussion led to a conversation about what we could do to help Eclipse developers building software for Windows. OpenOffice.org 3.0 DEV300_m3 converted this reference .docx document with mediocre quality. The notable problems were tracked changes, a comment, columns, an image, and an embedded Excel document. For comparison, the same document is shown rendered in Word 2007 and in OpenOffice.org 3.0 DEV300_m3. “Hackers are shrewd businessmen, so the more that Linux is found in the corporate data centre, running mission-critical systems, the more incentive there is to invest time and money in trying to compromise Linux. There’s simply more for hackers to gain and that means more reasons for users to spend more time and money securing Linux,” she says. The message is clear: if enterprise Linux is to continue on its upwards trajectory, its growing band of corporate supporters must ensure that the operating system does not become a victim of its own success. If there is a lesson from former New York governor Eliot Spitzer's scandal-driven fall (aside from the most obvious one), it is this: banks are paying attention to even the smallest of your transactions. For this we can thank modern software, and post-9/11 U.S. government pressure to find evidence of money laundering and terrorist financing. Experts say that all major banks, and even most small ones, are running so-called anti-money-laundering software, which combs through as many as 50 million transactions a day looking for anything out of the ordinary. Microsoft offered a sneak peek of the newest version of its CRM application, Dynamics AX 2009, at Convergence 2008, a meeting of Microsoft Dynamics users. The release, due in the first half of this year, is aimed at small and midsize businesses with what analysts say is extremely aggressive pricing. One major focus of the new release is managing compliance obligations, providing what Microsoft calls a "one-stop shop for compliance-related information." AX 2009 also includes enhanced global capabilities (such as multiple language support) that will give international businesses real-time visibility into operations such as overseas inventory of global locations. Web-based computing has a small disadvantage: working with an online program like, say, Writely (now Google Docs) is slower than using one based on your own machine, since info must constantly go back and forth from a remote server. It also has a huge disadvantage: when you're off line, you're out of luck. You can't get at your web-based mail, you can't get at your online calendar or contact list or documents, you can't do very much. Traveling in China, I spend a lot of time off-line, so for me this is a deal-breaker. All of which is why, to me, the news that Google Calendar will sync with Microsoft Outlook is big news indeed. Now, with 80 percent of passengers using these self-service [web check-in] options, the next step is electronic boarding passes, which essentially turn the hand-held devices and mobile phones of travelers into their boarding passes. At least half a dozen airlines in the United States currently allow customers to check in using their mobile devices, including American, Continental, Delta, Northwest, Southwest and Alaska. Notebooks with flash-based hard drives cost a lot and, according to managing partner Avi Cohen at Avian Securities, they don't work very well either. A large computer manufacturer is getting around 20 percent to 30 percent of the flash-based notebooks it is shipping sent back because of failure rates and performance that simply isn't meeting customer expectations, the firm stated in a report on Monday. Avian gathered this information on a recent swing through Asia. In addition to building brands, one of the big lures in casual games is the opportunity to attract advertising, including from food companies which have gradually agreed to limit the nature and volume of television advertisements aimed at children. But those agreements have not always extended to the Internet. Viacom, the parent company of Nickelodeon and MTV, may be moving the most aggressively. On Tuesday, Nickelodeon is expected to announce the first of 600 original and exclusive games for its network of Web sites, as part of a $100 million investment in game development. Len Kawell is a Distinguished Engineer in the Mobile Communications Business Group, working on the development of several aspects of the Windows mobile platform. Kawell is defining the application model for occasionally connected rich Internet applications in the mobile environment. He is also responsible for scaling Windows Mobile to new kinds of kinds of devices with larger screens and faster processors – also known as Mobile Internet Devices, or MIDs. Kawell joined Microsoft from Pepper Computer, a startup focused on mobile Internet device software for Web-connected applications to enable consumers to enjoy Web access and applications in a simplified environment. Earlier in his career, Kawell worked at Digital Equipment Corporation (DEC) on Virtual Memory System (VMS). He was also one of the founding team members of Iris, the company that designed and developed Lotus Notes, and he was one of the leaders of the Notes team upon its later acquisition by IBM. Kawell also co-founded an eBook software company, Glassbook, which developed a whole series of reading technologies and was later sold to Adobe. Kawell graduated from the University of Illinois in Urbana with a Bachelor of Science in Computer Science. A bigger question is how the bailout and forced sale will play on Wall Street. Overnight, the Asian markets sold off sharply and the plunge is continuing in the European markets. U.S. markets are also in for a turbulent day as investors ponder the thought of how a seemingly secure investment bank could evaporate literally overnight. Wall Street now will begin wondering which firm may be next to go the way of Bear Stearns, and many people are pointing fingers at Lehman Brothers (LEH). It would have been highly risky for other Wall Street firms if Bear Stearns had been allowed to go under because they are tightly interconnected with Bear as both borrowers and lenders. Any firms that are owed a lot of money by Bear would have fallen under suspicion, on grounds that they might not be able to pay their own debts if Bear failed to pay them. That could have triggered a dangerous wave of defaults. The rescue by JPMorgan Chase gives the financial system breathing room to pay off Bear's debts gradually. But these models do not fully capture what I believe has been, to date, only a peripheral addendum to business-cycle and financial modelling – the innate human responses that result in swings between euphoria and fear that repeat themselves generation after generation with little evidence of a learning curve. Asset-price bubbles build and burst today as they have since the early 18th century, when modern competitive markets evolved. To be sure, we tend to label such behavioural responses as non-rational. But forecasters’ concerns should be not whether human response is rational or irrational, only that it is observable and systematic. I encourage you to visit Amazon and purchase a copy of Galbraith's classic A Short History of Financial Euphoria if you find the previous paragraph hard to believe. You might also want to check out his 2004 book, The Economics of Innocent Fraud. He said: "It's mine - you can't have it. If you want to use it for something, then you have to negotiate with me. I have to agree, I have to understand what I'm getting in return." Looking far ahead, this is no longer about protecting the Windows-Office desktop franchises. The company's long-range goal is to rebuild society's infrastructure, to paraphrase Craig Mundie, Microsoft's chief research and strategy officer and Bill Gates' successor as the company's visionary. The platform isn't on any particular computer, phone or Web site. It's more the webbing that ties them all together and the tools you'll use to manage your personal data. Hospitals have begun installing Internet systems, complete with dedicated shopping channels, to help patients pick up goods they will need for their recuperation. The idea is that patients and visitors who are busy shopping and browsing the Web will be happier, less prone to bother nurses, and more likely to arm themselves with health care information that can help smooth the patient’s recovery. Microsoft Corp. has licensed Adobe's software for viewing online videos and other files on cellphones, the companies said today. Microsoft will distribute Flash Lite and Reader programs from Adobe Systems Inc. to cellphone makers who use its Windows Mobile software. With financial markets slumping, the number of initial public stock offerings is on track to hit a five-year low in the first quarter. Only nine have been priced since the start of the year nationally, and none in New England, compared with 62 in the nation and five in the region at this time last year, according to the Thomson Financial research house. Reflecting Bear Stearns’s dire straits, JPMorgan agreed to pay just $236 million for the firm, a figure that includes the price of Bear’s soaring headquarters on Madison Avenue in Manhattan. At $2 a share, JPMorgan is buying Bear Stearns for a third of the price at which the troubled firm went public in 1985. Only a year ago, Bear’s shares fetched $170. The cut-rate price reflects deep misgivings about the firm’s prospects. For JPMorgan, one of the few major banks to emerge relatively unscathed from the subprime mortgage crisis, the deal provides a major entry to prime brokerage, which provides financing to hedge funds, a source of enormous growth over the past decade, but a slowing business amid the market’s turndown. The internet allows expressions of discontent to be aggregated, giving workers the opportunity to stage protests without actually going on strike. The most dramatic example came last September in Italy, at the local arm of IBM. About 2,000 employees of the computer giant—logging on from home to dodge legal problems—staged a virtual protest against a new pay settlement at IBM's corporate campus in Second Life, an online virtual world. A month later the head of IBM Italy resigned and the RSU union agreed on a new pay deal. This innovative use of the internet was recognised with an award at the Forum Netxplorateur, a conference held in Paris in February. The award was presented by the president of Microsoft France. Mr Yang is an amiable character who hates aggression in management as much as in takeovers. So he made a gesture to Microsoft this week to avert hostility. Yahoo! had a deadline of March 14th for shareholders to nominate directors to be voted on at the annual meeting, which must be held between now and July. This would have forced Microsoft to put up its own slate of directors in opposition to the present batch, and thus to fire the first salvo in a proxy battle. But Yahoo! postponed the deadline, buying more time and keeping Microsoft officially friendly, for now. There are worse fates for Mr Yang than selling. He is 39, recently became a father, and he has a promising golf game. He is reluctant to cave in to Microsoft, but he probably has no choice, given his duty to his shareholders. He needs to explore all the alternatives and put up a bit of a struggle first, if only for the sake of his own pride. As any parent knows, the most painful part is always letting go. I wanted to take the time to give a narrative of what actually happened in the BRM, since we're now moving onto the final phase and I wanted to get this all in writing before I forgot. I wanted to give an overview of the topics discussed based on the documents that were published last week as well and provide a bit of commentary. While there has been a lot of discussion over the past week or two around the BRM, I think that much of it is misguided. Remember that the BRM wasn't some sort of competition, and there we no winners or losers. The purpose of the BRM was to approve the changes to the specification necessary to help resolve issues that have been raised by the various national bodies. They kicked off their official review over a year ago (and many had been reviewing content well before that). The final decision on whether or not DIS-29500 will be approved is still a couple weeks away, but in terms of the BRM I believe it was a success and the goals were met. But the best protection is to use a virtual private network (VPN) to provide strong authentication and encryption for all your hot-spot communications. A VPN does just what its name suggests; it creates, within the public network that everyone can access, a virtual private network that only you can access. When you're using a VPN all of your data travels within an impenetrable encrypted tunnel. This is particularly important if you are connecting to your company's internal network, in which case you will probably be given VPN software and perhaps an electronic "token" to use during log-on by your IT department. Individuals can opt for free or low-cost consumer VPN services such as iOpus Private Internet Gateway (www.iopus.com) which is both easy to use and rock solid. The software encrypts all inbound and outbound information, and should also help protect against spoof public hotspots called "evil twins" set up by hackers to capture private data. AnchorFree's Hotspot Shield (http://anchorfree.com) is another free alternative. You have an hour before your flight, so you log in to the Wi-Fi network at the airport. You look up some stock prices, check your e-mail, pay a couple of bills online, and surf a few Web sites. Has it occurred to you that curious or hostile eyes could be peering into your computer and your network? It pays to be paranoid. The head of Adobe's Platform Division, which oversees Flash Player, PDF (Portable Document Format) and other technologies, has left to join a Silicon Valley private equity firm. John Brennan, who was senior vice president of the division, also was a driving force behind the acquisition of Macromedia in 2005. He is leaving to become a managing director of Silver Lake Sumeru, a new business of Silver Lake, a leading technology-focused private equity firm in Menlo Park, California. Read the full post for more context-setting. I for one am glad this debate, at least in the ISO ballot domain, will soon be history. Does being pro-ODF require you to be anti-OOXML? Does being pro-ODF require you to be against DIS29500 mark II being accepted as an ISO/IEC standard? Does being anti-Microsoft require you to be anti-DIS29500? A lot of the FUD over the last year has based on the idea that if you are anti-Microsoft you must be pro-ODF and if you are pro-ODF you must be anti-OOXML and if you are anti-OOXML you must be against the acceptance of DIS29500 mark II. It is George Bush-like simplification Either you are with us, or you are with the terrorists that tries to excluded any middle ground. The logical fallacy here is called the fallacy of the excluded middle: the idea that reasonable people might reasonably disagree is not allowed. And thence to the imputation of corruption. Marko ends his post on an hopeful note for Documentum's future. I'm slightly less optimistic than he is because of one word: SharePoint. Acutally, two words: SharePoint and Alfresco. I think a likely future for the ECM category is SharePoint attacking from the left with Microsoft's standard iterative-improvement approach and Alfresco attacking from the right as the alternative to SharePoint. First-generation ECM vendors end up as the IBM mainframes in that scenario (i.e., they're expensive and everybody has one, but they aren't deploying new apps on them). I've blogged before on the similarities between ECM and BI, and I believe that while BI jelled as an integrated category that ECM never did. I lunched today with a well-known quantum physicist, who mentioned that about half his ideas, and most of his best ones, happen in the shower. I asked him whether he knew why. 1) There is an unconscious part of the mind that processes things without our knowing it, and in fact while our conscious mind is doing its thing. 2) Ideas are either algorithmic, like working through a differential equation, or non-algorithmic, which means they get worked out more or less randomly. There are video games that try to make you cry. There are games that gross you out. There are games that tell a sweeping story. There are games that make you think seriously about the world around you. Super Smash Bros. Brawl, which was released by Nintendo this week, is none of those. Brawl is about one thing: simple fun. And that’s good enough. In fact, it’s so good that Brawl will almost surely be one of the top-selling games of 2008 and may become the best-selling game yet for Nintendo’s popular Wii console. Last week Microsoft emailed us and said they are getting a large number of Windows Error Reports from a recent version of the Skype add-in for Internet Explorer. We thank Microsoft for reaching out to us to notify us of this problem. Naturally I was running a stale version of Skype (who knew? I had to go to the Skype menu to check for updates...), and disabling the Skype IE add-in seems to have done the trick -- IE8 beta 1 is now very stable on my XP PC (it has been stable for a week on my Vista test PC, on which I haven't installed Skype), and, when using IE8's IE7 emulation mode, the primary difference I can discern between IE7 and IE8 is that IE8 is a lot faster. BTW I find it perplexing that few people have complained about Skype's IE add-in, since it's essentially similar to the proposed IE6 Microsoft smart tag add-ins for which Microsoft was vilified during June, 2001 (leading to Microsoft's scrapping of its IE6 smart tag plans). Interesting pattern recently, with the NYT using Bits blog posts to elaborate on tech article context-setting. The chart below is also a timely reality check. The New York Times ran a story today that looked at the rapid rise in Internet traffic, led by the increasing popularity of YouTube-style video and other bit-hungry services. The article is an “explainer,” as we say. 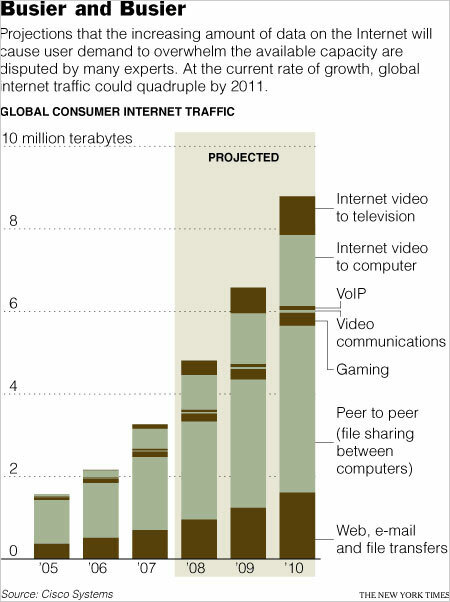 Projections of growth trends vary, as do views of the implications. But the takeaway: “The Internet traffic surge represents more a looming challenge than an impending catastrophe.” In the Internet economy, high-speed networks are the testbeds of innovation, so investment is required — mainly at the national and local level — to keep them healthy and fast. More than 40 million Internet users have accounts, Bebo said, a figure that has doubled in the last year as the company has moved aggressively to add local-language sites. The AOL relationship could help expand its user base. “We have a real opportunity for people to discover Bebo in the U.S. now,” the president of Bebo, Joanna Shields, said. Ms. Shields was hired from Google in January 2007 to broaden the audience and the content offerings. Bebo’s co-founders, the husband and wife team of Michael and Xochi Birch, are cashing out of the company.